Join us on Saturday, September 13 at 7:15 p.m. for our monthly meeting in Westchster. The topic will be Agency, Attorney or Foster Care: Which Path id Right for Me? A general roundtable will follow. The meeting will be held at our new Westchester County location, Betty Taubert Girl Scout House, 37 Wayside Lane, Scarsdale, NY. Join us at Blythedal Children's Hospital on Saturday, January 11 at 7:15 pm for our monthly meeting in Westchster. Our speaker will be Carolyn Berger and she will be presenting the topic "Discussing Adoption with Your Child in an Age Appropriate Manner." Following the speaker, we will have ageneral roundtable discussion. 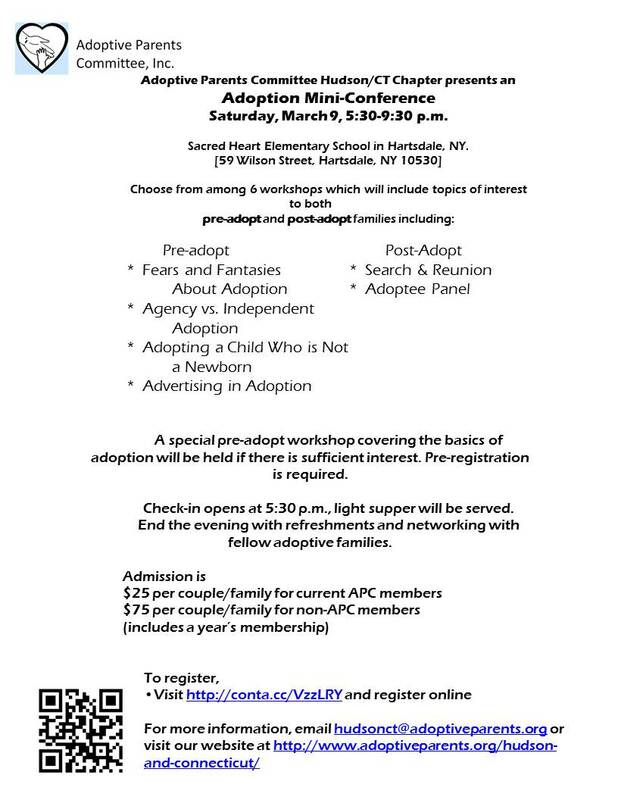 If you are interested in signing up for the pre-adopt workshop, email hudsonct@adoptiveparents.org to reserve your space. Join us for our first meeting of the new membership year in Westchester on Saturday, September 28. The meeting will be held at 7:15 p.m. at Blythedale Children's Hospital in Valhalla, NY. The meeting is free and open to the public. Our topic for the evening will be "The State of Adoption" presented by chapter co-presidents (and data hounds) Missy Carvin and Erin Koch. A general round table discussion will follow. If you are interested in attending a pre-adopt workshop on 9/28, please email hudsonct@adoptiveparents.org to sign up. There is no cost for the pre-adopt workshop, but pre-registration is required. The pre-adopt workshop will begin at 6:45 p.m. Despite the snow, join us tonight, February 9 for the Westchester meeting in Valhalla. We're doing something a little different this month. February's meeting will be a play date. Everyone is encouraged to bring their children if they have them, and we will have a parenting roundtable. Pre-adopt families, come hold babies, have fun with the older kids, learn about the parenting issues you can look forward to. The meeting will begin at 7:00 p.m. at the Blythdale Children's Hospital. Please don't risk life and limb to come, but know that there will be a meeting tonight.